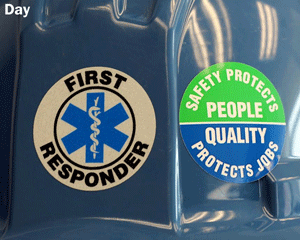 Reinforce team qualifications and training with these Hard hat stickers. Apply one to each side of the Hard hat. • These plastic labels are made from outdoor-grad vinyl. They Stand up to weather, abuse, abrasion, etc. • They stick to any clean surface and even conform to curves well. 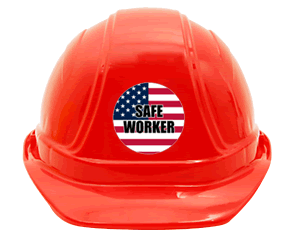 • These are not just for Hard hats - labels can be used on tool chests, machinery, lockers, etc. • Patented 3M material conforms to a compound curve. Hard hat decals are stretchable. • Special liner allows air bubbles to escape. You may also reposition the label easily. • HatHuggers™ vinyl is an opaque white. Labels are printed digitally with a full color printing process resulting in excellent colors and graphics. • Thin, 3mil material conforms readily to curved surfaces. • Labels are great for outdoors. Dirt, grease and water can be wiped off the smooth surface. 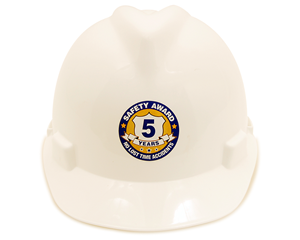 • This material is the favorite of hard hat sticker experts. Competitive stickers are printed on materials that are not nearly as conformable and end up with unsightly wrinkles. They often need to overcome the limited durability of the ink with an overlaminate that is applied to preserve the printing – which makes the labels even harder to apply cleanly. HatHugger™ labels use 3M inks throughout the sticker and are the premium material in the industry.